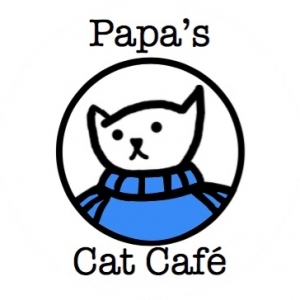 Papa's Cat Cafe is exactly as it sounds: it combines a cafe, baked treats, and cats! On one side is our cat playroom filled with 20 adoptable cats ready to be pet and snuggled and the cafe is separated by a dividing wall with a viewing window. It's the perfect place for midday relaxation, playdates, and meeting up with friends. It's also great for helping children socialize with animals. We accept walk-in visits or reservations. And we have 4 different options for private rentals for birthdays and other parties. The cafe is inspired by author, Ernest Hemingway, who also loved cats and whose Key West home has over 50 6-toed cats to this day. The decor of the cafe is inspired by his Key West home, and as such, our cafe promotes all things cats, coffee, and books! 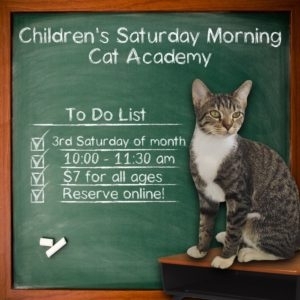 We are partnered with the local cat rescue group, Boone County Animal Care, who provides our adoptable cats. Want more info? Visit our website where we have a FAQ page that answers common questions!